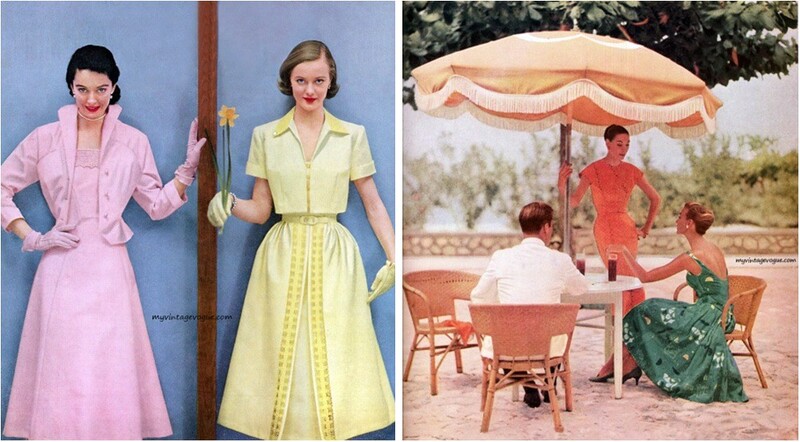 Ever since my early days of blogging My Vintage Vogue, an archive of popular fashion displaying photographs, models and designers from the 1920s to the 1960s, has been one of my favourite websites. It is always so inspiring. I love all the looks because they are incredibly pretty, classy, feminine and dressy; I adore the soft pastel colours, the beautiful flowers, stripes and polka dots, the bold statement colours and of course the red lipstick. The collection is extensive and very impressive; it’s a rather fitting and beautiful tribute to previous decades. I constantly wish I could dress up like this every single day. As I’m sure you all know, my favourite decade of vintage fashion is the 1950s primarily because I love the shape of the dresses, so I thought I’d make that the subject of this post. 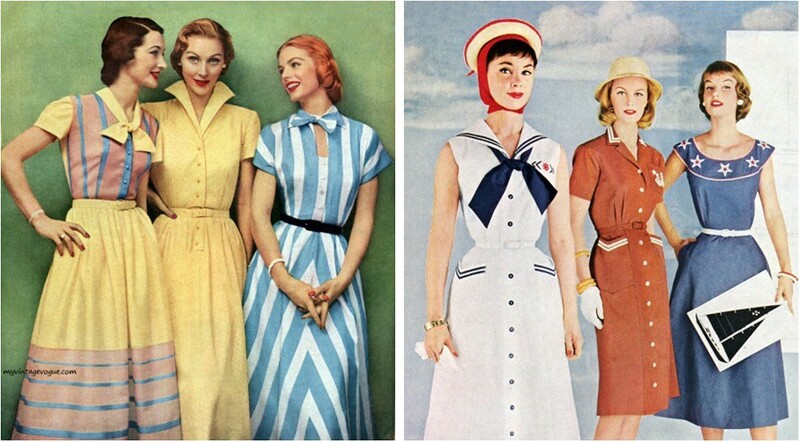 The sailor dress in particularly stands out to me because I’ve always wanted a sailor dress; I can just never find the right one. I like to think that my own style has a vintage element to it,; I thought it was the ultimate compliment when I once was asked whether this was a genuine vintage dress, but I do constantly wish I could find more ways to make my style increasingly vintage. I definitely recommend checking out this site. love these retro inspiration pictures. they are so classic and really never go out of style! Oh, such lovely photos! I'm in love with 50's style, it's so feminine and pretty. 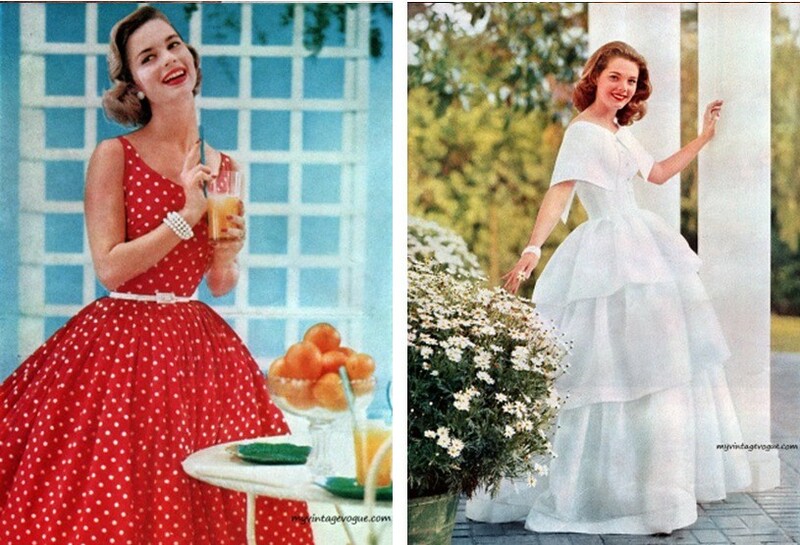 wow The 50's fashion looks so nice! I would love to wear those dresses!! Great collection, Will be eagerly waiting for more. 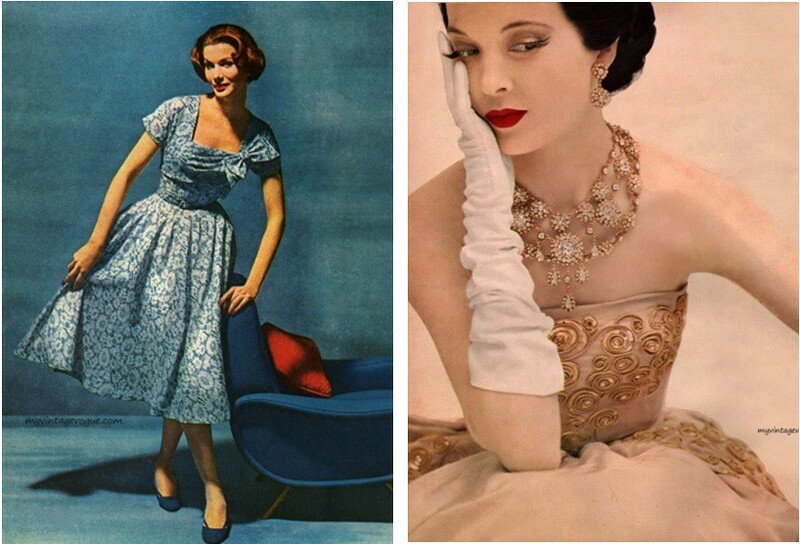 Lovely post, I adore the styles from the 1930's-1960's. I love watching To Catch a Thief, there are so many gorgeous dresses in that film. Thanks so much for following me, I've just followed back. 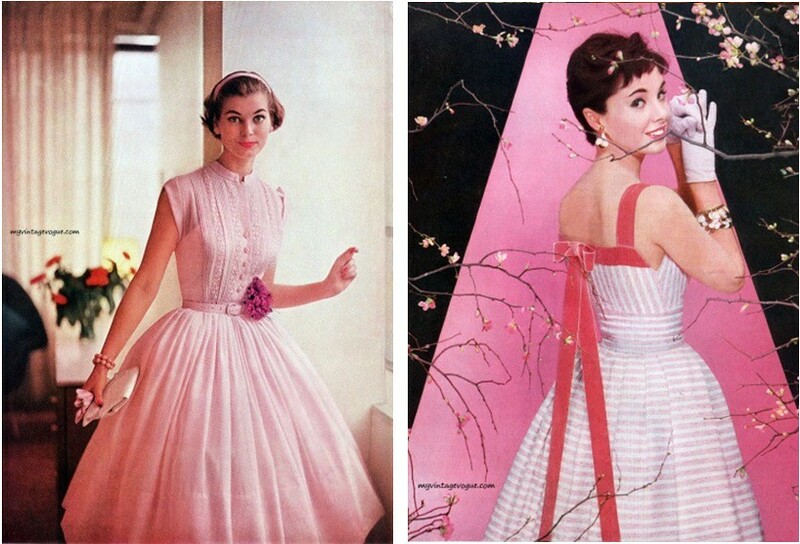 Love this post btw, I recently interned at Vogue and fell in love with all the vintage issues in the library there – these are some of the nicest pictures I've seen tho! 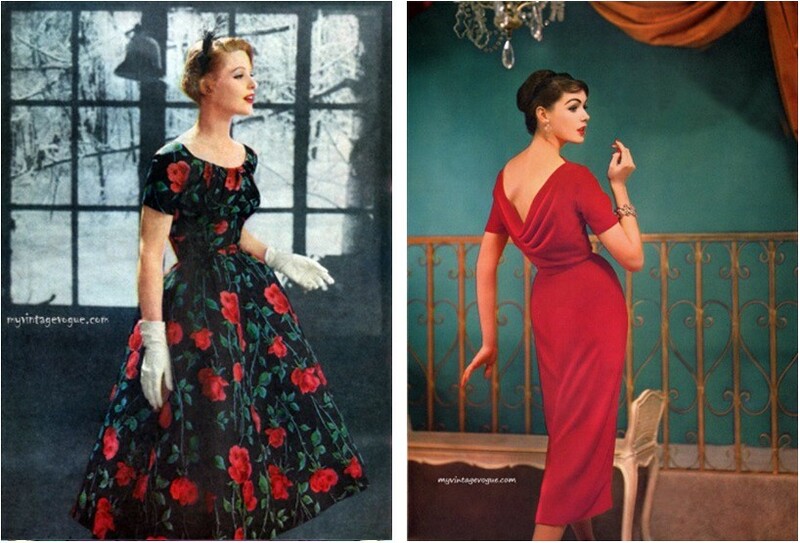 The silhouettes of the fifties make me swoon! Such great inspiration! I think long gloves need to come back into style- they're just so elegant and beautiful. I love these vintage styles. So elegant and glamourous. The structured silhouette of frocks is probably my favorite! Love these! 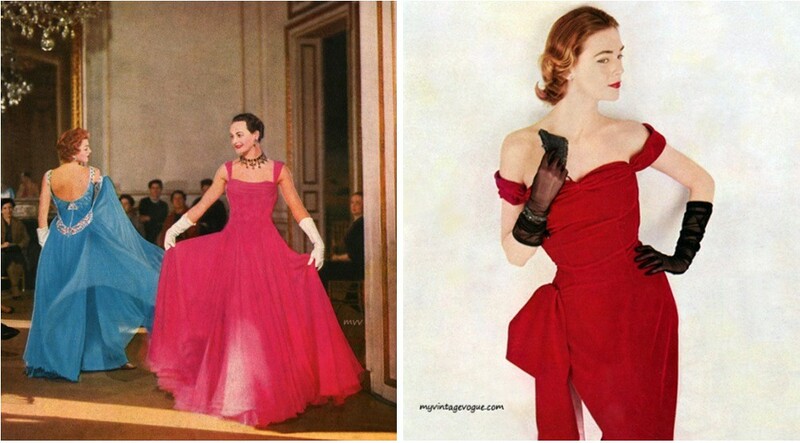 Especially the red pokadots, the red thy length one and the amazing ball gown with flowers! Such beautiful shots!!! Love this old school style! love these vintage photos! all the ladies dressed like a lady and everyone is so meticulously dressed! gorgeous! All of these styles would look so beautiful on you, Imogen – j'adore! So fun, I'd love to get to wear some of these, it seems so much more fun then the average clothes today. Oh my goodness, I LOVE them all!! 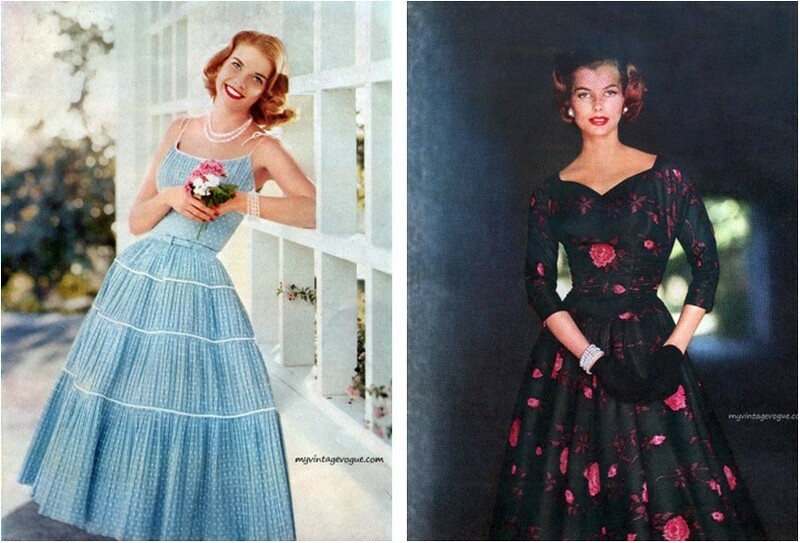 I agree, I'd love to wear pretty vintage dresses all day every day. What gorgeous images!! I love 50s style – what a great post! Thanks for this! Thanks for comment and the follow, sorry i'm so late in commenting back. I'm following you back on GFC and BL. I like that style, nice and ispirative. Have a great day. I`m always in love with 50-s elegance! Great pictures very inspiring! Thank you so much for your visit! I didn't answer earlier – and sorry for that – because I was on a long weekend/holiday! I love your blog! And the dresses! 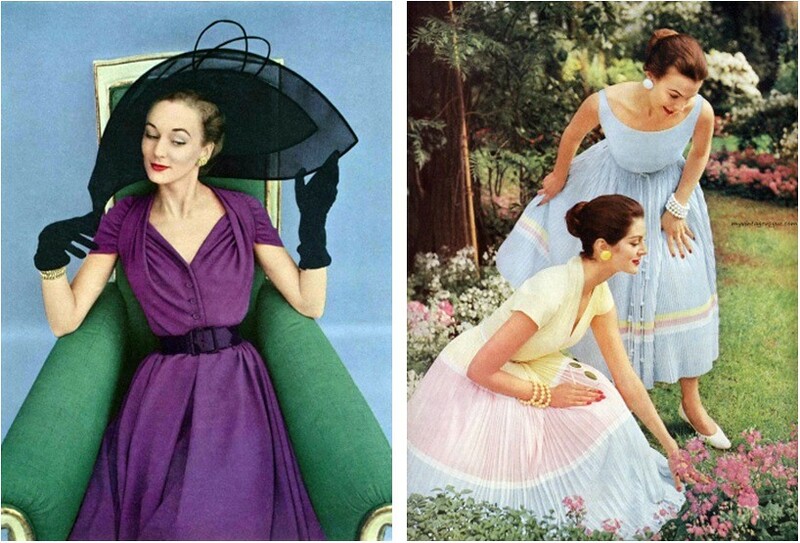 I love vintage dresses, full circe skirts, the 50's… so nice that you had that compliment! Wow, I love these sooo much. Just beautiful and elegant. Look at those tiny tight waist bands. How on earth did woman of larger sizes dressed I wonder? Awww vintage photos are such a classic! love vintage fashion! so amazing and darling! what lovely dresses! there's nothing better that feminity at that time, right? This is so amazing and beautiful blog. I like your vintage style clothing collection. Thanks for sharing this wonderful blog.